The Sunshine Policy was the foreign policy of South Korea towards North Korea until Lee Myung-bak's election to the South Korean presidency in 2008. Articulated in 1998 by then South Korean President Kim Dae-jung, this policy emphasized peaceful cooperation, seeking short-term reconciliation as a prelude to eventual Korean reunification. During the decade of its implementation, political contact between the two nations increased, several high-profile business ventures launched, and brief meetings of separated family members were facilitated. In 2000, Kim Dae-jung received the Nobel Peace Prize for his Sunshine Policy initiative. Kim Dae-jung inaugurated his Sunshine policy in a vastly improved climate from the authoritarian South Korean regimes before 1992. South Korea's economy had developed into one of the strongest in the world, enabling South Korea to shoulder more and more of it's own defense. The successful Seoul Olympics of 1988, and the collapse of communism in the Soviet Union and China shortly afterwards, raised South Korea's international reputation and eliminated North Korea's key support. In 1992, Kim Young-sam's election marked the beginning of friendly democratic rule in South Korea followed by Kim Dae-jung's election in 1997, marking a friendly approach toward North Korea. 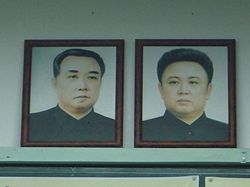 However, critics of the Sunshine policy argued that the policy ignored the fundamentally repressive and belligerent nature of North Korea, resulting in propping up the regime of Kim Jong-il. The term "Sunshine policy" originates in one of Aesop's fables. In the fable, the sun and the wind compete to remove a man's coat. The wind blew strongly, but the man clutched his coat and kept it on. The sun shone warmly, and the man voluntarily took off his coat to enjoy the fine weather. The policy aimed mainly to soften North Korea's attitudes towards the South by encouraging interaction and economic assistance. The policy has three basic principles. No armed provocation by the North will be tolerated. The South will not attempt to absorb the North in any way. The South actively seeks cooperation. Those principles convey the message that the South respects the North's sovereignty and will refrain from undermining its government. The South maintains the goal of peaceful co-existence rather than regime change or re-unification, though a unified Korea still exists as an implicit long-term goal of South Korea. Kim's administration outlined two addition major policy objectives. The first, the separation of politics and economics. Practically, that means that the South loosened restrictions on its private sector to invest in North Korea, limiting its own involvement essentially to humanitarian aid. Kim initially intended that policy both to improve the North's economy and to induce change in the North's repressive government, though the latter goal was later (at least officially) de-emphasized. Kim's second objective, the requirement of reciprocity from the North, initially intended that the two nations would treat each other as equals, each making concessions and compromises. Perhaps most criticism of the policy has stemmed from the significant back peddling by the South on that principle in the face of unexpected rigidity from the North. The South Korean government encountered difficulty just two months into the Sunshine policy, when South Korea requested the creation of a reunion center for divided families in exchange for fertilizer assistance. North Korea denounced that as "horse trading" and cut off talks. A year later the South announced a revision of the second objective, seeking "flexible reciprocity" based on Confucian values. As the "elder brother" of the relationship, the South would provide aid without expecting an immediate reciprocation and without requesting a specific form of reciprocity. The South also announced providing humanitarian assistance to the North without any expectations of concessions in return. The logical justification for the policy change lay in the belief that, even in light of its continuing famine and economic deprivation, Kim Jong-il's regime would survive even if the South were to apply strong pressure. The South contended that military tensions could be lessened through bilateral and multilateral frameworks, emphasizing the normalization of political and economic relations between both the United States and North Korea as well as Japan. Kim Dae-jung's administration first formulated and implemented the Sunshine Policy. North-South cooperative business developments resumed, including a railroad and the Kumgangsan Tourist Region, where several thousand South Korean citizens traveled every year. Though negotiations proved difficult, the North and South conducted three reunions between divided families (though the North canceled a fourth at the last minute). In 2000, Kim Dae-jung and Kim Jong-il held at a summit meeting, the first between heads of state of the two nations. After the summit, talks between the two nations stalled, possibly due to a schism within North Korea between hard-liners and reformists. Criticism of the policy intensified and Unification Minister Lim Dong-won lost a no-confidence vote on September 3, 2001. After the terrorist attacks of September 11, 2001, the United States proclaimed North Korea a third leg of the Axis of Evil, along with Iraq and Iran, and the North responded by cutting off talks with the South. In 2002, a naval skirmish over disputed fishing territory killed four South Korean sailors, further chilling relations. Credible allegations later came to light that Kim's administration had arranged the 2000 summit meeting with payments worth several hundred million dollars to North Korea. President Roh Moo-hyun continued the policy of his predecessor, resulting in relations on the divided peninsula warming somewhat since 2002. 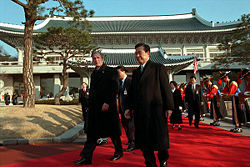 In 2003, the issue of the North's possession of nuclear weapons resurfaced, with North Korea characteristically accusing the United States of breaching the agreed framework. Roh stayed committed to the policy and his government continued to supply the North with humanitarian aid. The two governments continued cooperation on the projects begun under Kim Dae-jung, also starting the Kaesong Industrial Park, with South Korea spending the equivalent of just over $324 million on aid to the North in 2005. A pro-North Korean trend in public attitudes surfaced, though significant differences between generations, political groups, and regions existed. Many critics of the policy believe that, rather than increasing the chances of reunification or improving the human rights situation in North Korea, the ruling party used the issue for political gain in domestic politics in the South. Some see the Kaesong Industrial Park as merely a way for large South Korean companies to employ extremely cheap labor. As proof, critics have noted the continuing provocations and criminal activities committed by the North, such as the 2002 sea battle that left several South Korean sailors dead and the counterfeiting of American money. Critics point to the North's general unwillingness to reciprocate Seoul's gestures of goodwill, as evidence that the North used the South's money and aid to prop up the regime of Kim Jong-il. Critics contend that, in exchange for providing humanitarian aid, the South should demand that the North return kidnapped South Korean citizens and the remains of POWs from the Korean War. In 2006, North Korea backed away from its pledge to re-open direct rail links between the North and South. Pyongyang remained silent about the sudden turn-about and when the link might reopen. Critics of the Sunshine Policy pointed to that as further proof of North Korea's failure to repay the South's goodwill with similar gestures. Many observers saw a weakening of the U.S.-ROK alliance as a result of the Sunshine Policy, contending that the South had favored the North's interests over those of its ally the United States. Further, critics contend that South Korean politicians censored criticism of the North. South Korean politicians ignored the sacrifices of its own soldiers so as to avoid upsetting the North, critics continue, and that all those ill effects have been harmful to the South's national interest as well as the alliance with the United States, actually damaging the chances for a smooth and peaceful reunification. Internationally and at home, the South Korean government was criticized for repeatedly abstaining from United Nations votes condemning the North's human rights record. The government defended the abstentions by citing the special character of inter-Korean relations (in other words, following the objectives of the Sunshine Policy). On October 9, 2006, following the nuclear and missile tests, South Korea suspended aid shipments to the North and put their military on high alert status. Even supporters of the Sunshine Policy express concern regarding how South Korea can maintain a cooperative policy towards the North when such provocative acts continue. The government of South Korea insisted that at least some aspects of the Sunshine Policy, including the Mount Gumgang Tourist Region and the Kaesong Industrial Region, would continue. From March 2008, however, the new president of the South, Lee Myung-bak and his party took a harsher stance at North Korea, and the South Korean government stated that any expansion of the economic cooperation at the Kaesong Industrial Region would only happen if the North resolved the international standoff over its nuclear weapons. Relations again chilled, with North Korea making threatening moves such as a series of short range ship-to-ship missile tests. After the 2009 North Korean nuclear test, the relationship between Seoul and Pyongyang was again strained. South Korea's response to the nuclear test, although dampened by the death of its former President Roh Moo-hyun, included signing the Proliferation Security Initiative to prevent the shipment of nuclear materials to North Korea. In November 2010, the South Korean Unification Ministry officially declared the Sunshine Policy a failure, thus bringing the policy to an end. ↑ MSNBC, U.S. says N.K. missile tests "not constructive", March 28, 2008. Retrieved January 30, 2012. ↑ Kiho Yi, The North Korean nuclear test: The South Korean reaction, Bulletin of the Atomic Scientists, 5 June 2009. Retrieved January 30, 2012. ↑ Steve Herman, South Korea Formally Declares End to Sunshine Policy, Voice of America, November 18, 2010. Retrieved January 30, 2012. ↑ Nagesh Narayana, South Korea dumps Sunshine Policy with North, opts to go solo, International Business Times, November 19, 2010. Retrieved January 30, 2012. Kim, Dae Jung. Sunshine policy sunshine policy of the Republic of Korea: President Kim Dae-jung's satellite appearance on the CNN World Report Conference at the CNN Headquarters in Atlanta, Georgia, USA, May 5, 1999. Seoul, Korea: Korean Overseas Culture & Information Service. Korea (South). Sunshine Policy for Peace & Cooperation. Seoul: The Ministry, 2002. Mistry, Hemlata. Sunshine on the Korean Peninsula an analysis of the Sunshine Policy's Effectiveness in Handling Significant Issues Impacting Relations Between North and South Korea. Thesis (Hon. )—North Central College, 2005. Newsweek. "INTERNATIONAL—The Koreas: The 'Sunshine Policy' Loses Its Glow." 138(11) (2001): 36. Son, Key-young. South Korean Identities in Strategies of Engagement with North Korea: A Case Study of President Kim Dae-jung's Sunshine Policy. University of Sheffield, 2004. The Bush Administration and the Korean Peninsula, Interview with Dr. Suh Sang-mook, Stanford Journal of East Asian Affairs, Spring 2001, Volume 1. The Cost of Sunshine, Time, February 3, 2003. Clouds Over South Korea's "Sunshine" Policy: Dynamics of the Internal Debate, Center for Asian Pacific Policy, RAND, 2002. Despite U.S. Attempts, N. Korea Anything but Isolated, Washington Post, 12 May, 2005. Sunshine Policy in a Nutshell, a publication of the Federation of American Scientists. Sunshine policy warms old rivals The Guardian, June 9, 2000. No sunshine yet over North Korea Asia Times, May 13, 2005. This page was last modified on 27 October 2015, at 16:39.